2011 will bring some interesting papers on advanced locks. 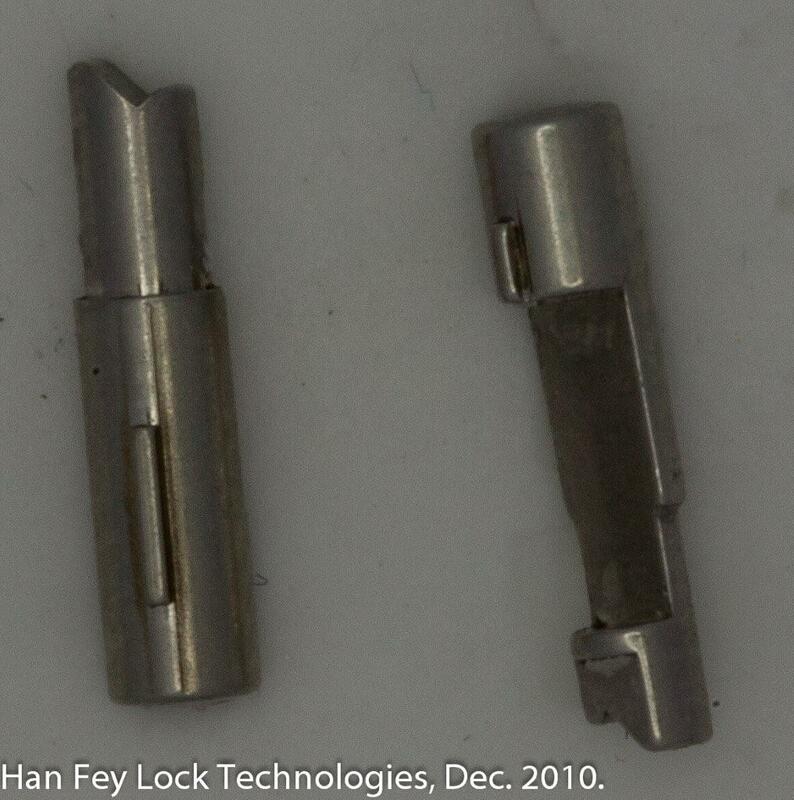 Both Michael Huebler and Han Fey are working on articles on some unique locks. Han’s article will be about the latest lock from Assa, the d12. In my previous posting I asked what two locks had in common. I will now give you the answer. The bottom lock is the famous ‘seven pin’ ASSA 700 lock, and contains some extremely nasty anti-pick pins. In short: if you tension the lock and lift a few pins, the lock will ‘freeze’. Once a pin is locked between the core and the house you can only move it again after (almost?) fully releasing tension. 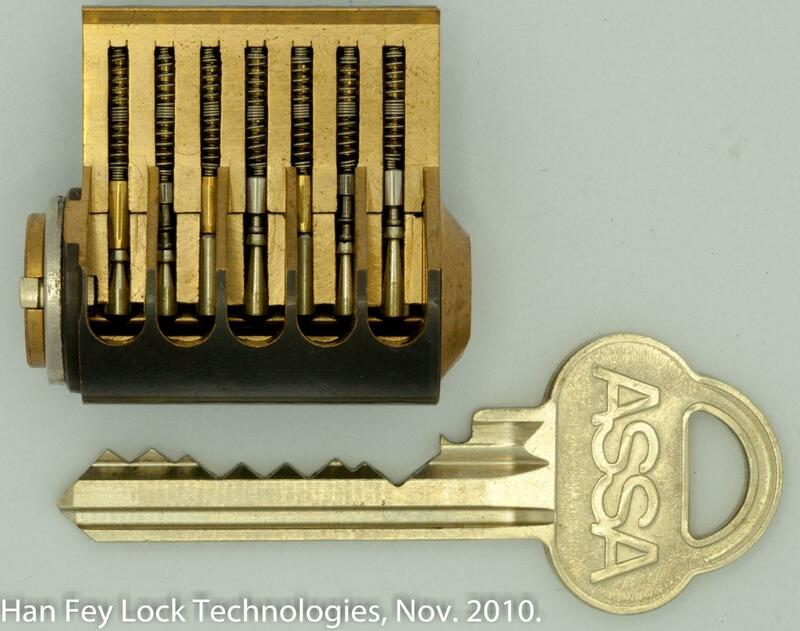 We learned this seven pin lock was developed and produced already over a period of 50 years (! ), and is still a very common ‘medium security’ lock in Sweden. And they call it medium security. Sure, if you compare the seven pin version to locks like the Assa Twin system (pdf) (like Twin Combi and DP) there is still a huge difference between them. But I dare to call the design of the 700 high security anyway. 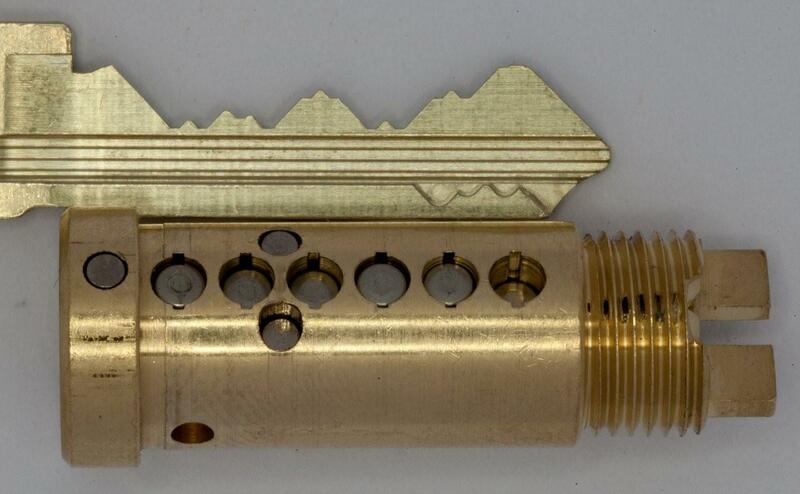 The top image from my previous posting shows the new ‘medium security lock’ by Assa. It is a new design to replace the Assa 700 lock and it is called the d12. So that is what they have in common. Han’s preview of the d12 article already covers twenty pages(!). Here is some basic info about this amazing new lock. The pin has two tips, and there can be an offset between the left and right contact points. This gives very interesting properties for masterkey-systems. To prevent the pins from twisting, they are equipped with little wings that fall into a slot in the channel of the core. And the wings also make some of the pins ‘float’, so a ‘999’ key will not make contact with all pins. 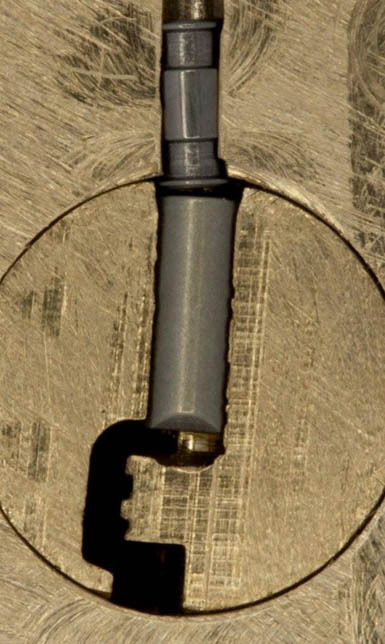 If you look at the image, you can see the fifth pin is much longer and is being operated by a lower portion of the key. And if you manage to get your picktool inserted, the lock has the same anti-pick properties as the 700 series. You will have to be patient for Han’s article to read all the ins- and outs of this system, but I can just say it is neat to see groundbreaking new technology like this enter the market. And last but not least: there was a small error in Han’s image in my previous post. Pin six was not positioned correct (as Michael Huebler pointed out in the comments). Below is the correct image. This entry was posted on Wednesday, December 29th, 2010 at 14:10 and is filed under Uncategorized. You can follow any responses to this entry through the RSS 2.0 feed. You can leave a response, or trackback from your own site. The only bad thing is that the d12 is not protected against impressioning as the 700 SCD. While impressioning is definitely going to be possible. Don’t let that fool you into thinking it will be an easy task. Because of the bottom cut(s) I believe that you wouldn’t have much luck impression it with regular hand files. To reasonably impression one, you would likely need to use a key machine. Farmerfreak: Use your regular round file, the extra bits on the pins will not make it more difficult. But in ASSA 700-scd series it is allmost impossible because the bottom pins rise if you get tension on them in near of the sheerline. However, it is self impressioning systems that are “dangerous” for a lock today. Impossible with 700-series. Wouldn’t the reason for calling these “medium secure” be the fact that they sit “on top” of the metal closing mechanisms inside the door, in stead of through the metal bits? Knocking it off would only require moving some woodwork. Mind you: I only played with these locks once (briefly), so I could be missing some vital facts. If the long pin is always in the same position, you could drill a hole in the key above it and use a thin round file to cut deeper. The most important and so far not answered questions is: Where do I get one of those ASSA D12? D12 is an good cylinder but the twin series are crap and always malfunctions. The 700 cylinders was the best because it always worked but the construction was to old and unsecure. @Jos Weyers no it’s not why it’s called middle secure. It’s because it only has one independent locking element, like one row of tumblers and no sidebar or something else. the lock case is protected with drill plates and on the backside of the door you should have an trailing edge device for hinged side. That’s how we lock our homes in Sweden and our doors opens outward for security reasons and not inwards as yours. And since it’s ASSA it wasn’t pin 6 that were wrong before it was pin 1, since assa count’s backwards. @Han Fey that pdf had some errors and incorrect information in it. Here in sweden we don’t think to well of ASSA since they kills the competition and have built an monopoly. ASSA is the microsoft, in sweden the even owns the suppliers that sell to the locksmiths (AKI and Copiax) and even Locksmiths like “swesafe”. So we have no free competition in sweden because of ASSA. « What do these two locks have in common? Entries (RSS) and Comments (RSS). 49 queries. 0.397 seconds.